Retired now, the house is her only residence and only asset. But if tycoon Donald Trump has his way, a New Jersey government agency will use its power of eminent domain to condemn Vera's property, take it away from her at a bargain-basement price, then transfer the ownership to Trump for a fraction of the market value. Trump then plans to park limousines where Vera's bedroom, kitchen and dining room now stand. In short, New Jersey will take from one private owner and transfer that property to another private owner for his exclusive gain. Unfortunately, Vera Coking is not alone in this battle. Other private property owners in Atlantic City and nationwide find their property rights under attack from unethical marriages of convenience between developers, local governments and state agencies. The result is an erosion of a fundamental right. And the legal landscape-especially at the federal level-is stacked against the homeowners. Unlike most developers, Donald Trump doesn't have to negotiate with a private owner when he wants to buy a piece of property because a governmental agency-the Casino Reinvestment Development Authority or CRDA-will get it for him at a fraction of the market value, even if the current owner refuses to sell. Here is how the process works. After a developer identifies the parcels of land he wants to acquire and a city planning board approves a casino project, CRDA attempts to confiscate these properties using a process called "eminent domain," which allows the government to condemn properties "for public use." Increasingly, though, CRDA and other government entities exercise the power of eminent domain to take property from one private person and give it to another. At the same time, governments give less and less consideration to the necessity of taking property and also ignore the personal loss to the people being evicted. Most courts have declined to put limits on the exercise of eminent domain. For a local government and state agencies, all the benefits weigh in favor of using eminent domain. The New Jersey and federal Constitutions state that "private property shall not be taken for public use without just compensation." This constitutional provision imposes two limits on the taking of private property: first, that the use must be public, and second, that just compensation must be paid. If private property could be taken for any use at all, the term "public" would not have been included. Originally, eminent domain was a power that allowed the government to construct public works, like roads and aqueducts. Government was limited to taking only that property necessary for the public use. Gradually, though, government has come to ignore these limits. Now, local governments will take property and give it to a private person for their economic profit. Anything that a government might be allowed to do at all - storage, planting flowers - it can condemn property in order to do. And it does not need to show that it actually needs the property in question. This erosion of the doctrine of eminent domain has led to predictably appalling results. In 1981, Detroit destroyed Poletown, the last racially integrated neighborhood in the city, and gave the property to General Motors to build a plant. The closely-knit, historic community could not be replaced, and the plant did not live up to its promise of bringing economic prosperity to the city. Likewise, when the city of Oakland decided that it didn't want the Raiders football team to move to Los Angeles, it tried to exercise eminent domain, take ownership of the team and force them to stay. Now New Jersey has decided that large casino hotels are the road to prosperity for Atlantic City. Any homes or small businesses that happen to be in the way will be demolished. The Trump project is only one of several such instances. In another, CRDA has begun the process to take a small motel from Joseph and Gilda Ann Rutigliano, who have run it for the last 30 years, and give the property to the Tropicana Hotel across the street for parking. There are already three parking lots, one owned by Tropicana and two owned by the Rutiglianos, but CRDA doesn't have to consider that no additional parking lots are needed. Another proposed project will remove an historic block of houses, owned and occupied by African-Americans, and build a tunnel from one street up to a new casino. In essence, Trump and other casino developers in Atlantic City shop for properties they want and CRDA does the buying for them at fire-sale prices. Knowing that the threat of eminent domain is real, the homeowners are left with no room to bargain -- most hang their heads and accept whatever is offered. A particularly interesting fact about the Trump development is that, although he claims he wants the land for a park - a so-called public use-nothing would stop him from removing the park and constructing another casino. In fact, the plans suggest that his intention is to use the lot as a space to more easily turn-around the limosines that shuttle wealthy players to & from his casino...but if the proposed "public use" exists for a single day, the developer has satisfied his end of the agreement and the land is his to do with as he pleases without further consideration of the "public's" use. On May 6, 1994, Vera Coking received a letter from CRDA stating that her property had been "appraised" at only $251,250 (nearly $750,000 less than her earlier offer). CRDA offered her that amount to acquire the property and notified her that she would have 30 days to accept or CRDA would institute suit in the Superior Court "to acquire your property through CRDA's power of eminent domain." In a May 24, 1994, letter, CRDA Executive Director Nicholas Amato stated in capital letters, "You may be required to move within 90 days after you receive this notice. If you remain in possession of the property after that time, CRDA may be able to have you and your belongings removed by the sheriff." On July 28, 1994, Susan Ney, Director of Housing Development for CRDA "instructed CRDA's counsel to commence condemnation proceedings in the Superior Court of New Jersey." Vera Coking opposed the condemnation in court, and while the case was pending, Trump continued with construction. The Trump Plaza Hotel and Casino was completed; grass was put down on one side of Vera's property and parking lots operate on the other sides. The only part of the project left is razing Vera's house and two other buildings on the block. The final project included a new casino (even though Trump's original plan did not.) In March 1995, the Atlantic County Superior Court ruled that CRDA could not fund projects with new casino space and, because CRDA couldn't fund the project, it also couldn't condemn Coking's and her neighbors' properties. On November 13, 1996, however, the Appellate Division reversed this decision and stated that the condemnation should go forward. Vera Coking and her neighbors, who have been similarly mistreated, cannot believe the government can throw them out of their homes and businesses in order to give the property to Trump. Vera Coking explains, "This is my home. This is my castle." Vincent Sabatini lives on the same block as Vera. He and his wife own and operate Sabatini's Italian Restaurant, a family business that put four kids through school. When asked about CRDA's offer of $700,000 for their property-a figure that wouldn't even cover the cost of legal fees and starting up a new restaurant-he exclaimed, "I've been here for 32 years, and they want to give it to Trump. I don't want their money. If they left me alone, I'd be happy and sell a few spaghettis." Peter Banin and his brother own the third building on Vera's block. A few months after they paid $500,000 to purchase the building for a gold shop, CRDA offered them $174,000 and told them to take the money and leave the property. A Russian immigrant, Banin says, "I knew they could do this in Russia, but not here. I would understand if they needed it for an airport runway, but for a casino?" CRDA's attempts to take these properties violate the New Jersey and U.S. Constitutions. First, taking property from one person to give to another is not a "public" purpose. "The necessity that the use shall be public excludes the idea that the property may be taken . . . and ultimately conveyed and appropriated to a private use." Atlantic City won't own the limousine lot or grassy area; Trump will, and he can convert them into whatever he wants once this project is completed. Nothing can stop Trump from turning around the day after the park is completed to tear it up and build another casino. Second, condemning these properties is totally unnecessary. Under New Jersey law, government may not take more property than it needs for the public use. Even the CRDA enabling statute states that it can exercise eminent domain only when property is "necessary" for project completion and "required" for a public purpose. N.J.S.A. 5:12-182(b). Because the casino and hotel project were successfully completed without these properties, they manifestly are not necessary. Third, New Jersey has unconstitutionally delegated its condemnation power to private parties. The New Jersey legislature delegated the power to CRDA. CRDA then defers to casinos that apply for funding to determine which private homes and businesses will be torn down. It must get approval from the casino before issuing a notice of condemnation. If the casino decides it doesn't want that property, CRDA won't condemn it. Finally, these condemnations are an unreasonable and abusive use of government power. Over the last ten years, New Jersey courts have begun to recognize that local governments can and do misuse their power over people's property. 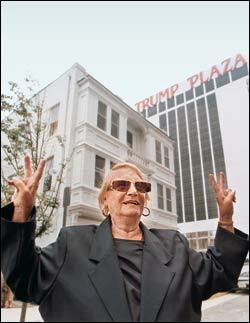 Atlantic City wants to take Vera Coking's home of 36 years, the Sabatinis' 32 year-old business, and the Banins' thriving jewelry and gold business and give them to Trump to install a place for limousines to wait for high-rolling patrons at the casino and a large lawn that few will ever use. It's hard to come up with a more frivolous use of the power of eminent domain. Still, most of the voters are for it, citing an increase in tax revenue for the property. They seem unconcerned about the harm they'll be doing to a widdow & two shop owners who just want to be left in peace. This case asks the New Jersey Supreme Court to read three important words of its Constitution-the requirement that a taking be "for public use"-and force local governments to comply. Until there is a ruling that returns substantive meaning to these words, government entities will continue to try to take peoples' property for any reason at all. If private property may be taken from one and given to another private individual, and if the determination of which properties are to be taken may be delegated to the person or community benefiting from the condemnation, and if the public purpose of the condemnation project may not be reviewed by the courts, and if the question of the necessity of the condemnation may be delegated to the beneficiary and may not be reviewed by the courts, then are there any limits on the exercise of this government power? Without accountability or constitutional constraints, all the incentives promote aggressive, unbridled use of the eminent domain power, regardless of the impact on innocent homeowners. It is time to shift the balance away from government power and back to its citizens.